Happened to look out the bedroom window and saw "these two". 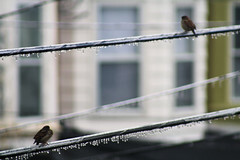 Look at em...keepin balance on icy coated telephone wire perched way above the pavement. Truthfully, I was looking for icicle patterns to shoot, and started zooming in and caught "Tweedle Dee" in the bottom left hand corner of the frame. Since I had him in focus..and at a fast shutter speed with SDoF, I had to start shooting. Good thing I did, cause it the next instant or so..... they took off.